A badger dressed as a cowboy, an owl smoking a cigar, and the three little pigs with the big bad wolf all wearing moccasins and turquoise jewelry – not the typical iconography associated with Native American kachinas. Selected from the James R. Nolan Collection of almost 250 important Native American works of art, these kachinas often get a double take. On first glance they might seem disconnected from traditional Native American imagery, however, these kachinas are based on the Navajo creation tales and the idea of humans and animals living and working together. While kachina carvings are traditionally a Hopi practice, many Navajo artists have adapted the tradition to explore their own culture and the role of animals in Navajo folklore. As an essential part of Native American culture, animals play a dominant role in creation stories and refer to a time when animals walked upright to create a new world. The legends emphasize mutual respect, compassion and equality among all beings, as well as the idea that all beings are of equal importance in the community. However, due to the imperfect world we live in, greed, jealousy, and the improprieties of man caused the animal and human worlds to eventually separate. According to the tale, many animals chose to stay on earth with the humans. Others, however, such as the badger, rejected remaining with man. Thus, Cowboy Badger depicts the animal as if it were human, upright in contemporary clothing, suggesting a time before the separation or what the badger may have been if he remained in the human world. 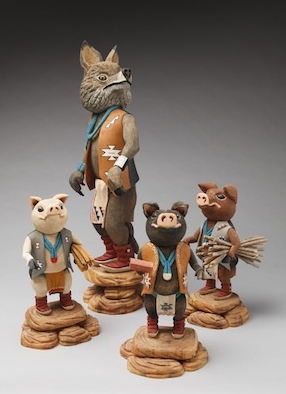 The artists use the kachinas to recreate the lessons taught through these myths, and use animals in humanistic forms and upright positions to illustrate the strong connection between humans and animals. 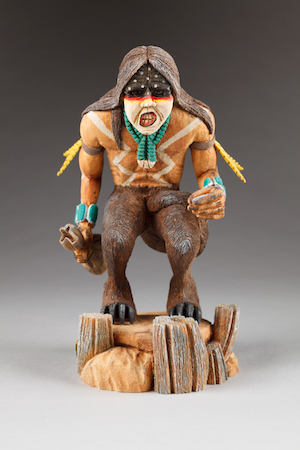 Because of cultural taboos, Navajo artists typically do not carve specific deities of their own culture and the use of animal representations in contemporary kachinas have played a major role in the development of Navajo carvings as a genre of their own. Funded in part by UW Art Museum Gala Funds.